"This light, delicate smoothie is perfect for those hot summer days. The Asian pear flavor really comes through." 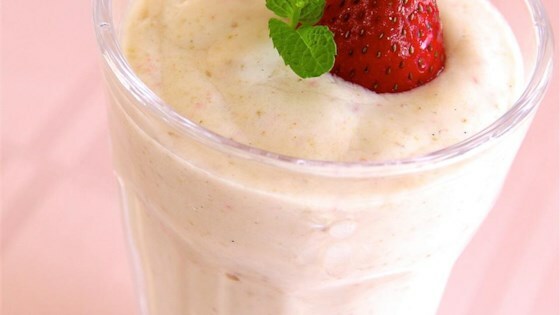 Place the ice, Asian pear, strawberries, yogurt, milk, and sugar into a blender; blend until smooth. I've never used a pear for smoothies, but I really liked this. I don't care for ice in mine so I used frozen strawberries. I also left out the sugar. Great smoothie! Thanks! Gorgeous smoothie, quick and simple to make. Tastes so delicious, first time ever using pears. Just know I will be making this again. Thank you for sharing. Yum!!!! I had a couple asian pears I wasn't quite sure what to do with, so I decided to make this. This was fantastic...one of my favorite smoothies...thanks for sharing!! Didn't used any sugar and added a banana. Very yummy! You can delete the sugar, and add in it's place, Stevia...a natural sweetener found at health food stores. It takes very little...just a sprinkle, and tastes just as good.